A vertical tricolour of blue, yellow and red with the national coat of arms centred on the middle stripe. The middle stripe is one eighth thicker than the outer bands. 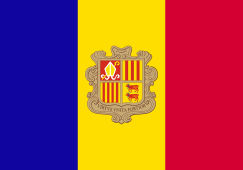 The national flag of the Andorra was adopted in 1866. The flag is a vertical tricolour of blue, yellow, and red. The Coat of arms of Andorra is in the centre. The three vertical bars look of equal width but the centre yellow bar is slightly wider than the other two. The ratio of bar widths is 8:9:8. The look of the flag is from the flags of France and Spain. The motto in the coat of arms in the middle stripe Virtus Unita Fortior means "Strength United is Stronger". This page was last changed on 7 January 2018, at 23:22.